Can ACMI contracts deliver the affordability and flexibility that regional carriers seek to underpin their operations? Angus von Schoenberg, Industry Officer at regional aircraft lessor TrueNoord looks at the potential benefits and risks of long-term ACMI contracts. Some, including a UK-based airline Titan Airways and Danish carrier Danish Air Transport have been active in the Aircraft, Crew, Maintenance and Insurance (ACMI) leasing market for many years, but traditionally focused on short-term, ad hoc requirements to cover unscheduled maintenance events, industrial action, peak time requirements or charters where higher rates can be achieved. Recently, some European carriers have begun to develop long-term ACMI contracts, either as a diversification strategy from their scheduled services or as their main core business. Long-term, third-party ACMI contracts are prevalent in North America where regional operators provide capacity to network carriers under capacity purchase agreements (CPA), for periods that can exceed 10 years. Operators including Skywest, Republic and Jazz fly for majors on this basis. Increasingly, European carriers are adopting a similar model to fly for larger airlines, a main difference being that no major European airline has yet committed to a 10-year agreement. SAS has been a leader in contracting with ERA member CityJet to provide capacity on CRJ900s. CityJet has changed its business model from a scheduled airline to principally an ACMI provider. Apart from its sole remaining scheduled route between Dublin and London City, its fleet of 17 CRJ900s now operates exclusively for SAS. Furthermore, three of its Sukhoi SSJ100s now operate for Brussels Airlines under an ACMI agreement and some of its remaining RJ85s provide capacity for KLM. CityJet’s other aircraft operate in the charter market. Nordica operates most of its services on ACMI programmes. This includes a newly-acquired fleet of five ATR 72-600s for SAS and a fleet of CRJ900s that fly for LOT Polish Airlines. Another example is Adria, which specialises in ACMI work for Austrian Airlines, Swiss and Luxair using an expanded fleet of CRJ900s. Other carriers operate a hybrid of scheduled and ACMI services, including Helvetic Airways and Flybe, which designate this as white label flying. Previously, Flybe operated ATRs on behalf of Finnair and today it operates DHC8Q-400s for Brussels Airlines. Conversely, Flybe also leases in ACMI capacity from Stobart Air for its Southend operation. Meanwhile, Air Nostrum has established an Irish carrier, Hibernian Airlines, through which it is expanding its ACMI capability by providing capacity for European carriers including SAS, and smaller Latin American carriers. One trend in the growth of ACMI has been the success of operators from Baltic or Eastern European countries that have been able benefit from their lower cost base. Only time will tell how long this advantage will continue and how other competitors in the ACMI space respond. So what does this trend mean for operators moving forwards? TrueNoord considers the benefits of longerterm ACMI contract flying are finely balanced in a European context but for those moving in this direction there are some compelling factors. First, the risk of selling seats is passed to another party so that revenues are generated on a predictable fixed-rate basis irrespective of passenger numbers on any service. Secondly, sales and distribution costs of seats are removed so the airline not only reduces risk, but also can dismantle part of its cost base. Furthermore, since such ACMI contracts are typically with larger network carriers to feed their hubs, less wellknown regional airlines can benefit from the perceived quality of a contract with a major airline. This can assist their buying power with third-party suppliers. Lessors and other financiers usually take great comfort from a contract with a major airline. This either enables them to lease or finance suitable aircraft that the finance community would otherwise have not provided at all, or it allows the regionals to secure lower finance costs. Similar reasoning applies to other third-party suppliers which can extend to attractive maintenance costs and better credit terms. to long attractive aircraft financing to match their ACMI contract term. If the regionals optimise their equipment finance terms and these do not match the length of the ACMI contract, they risk becoming stuck with no revenue on expensive assets if the underlying agreement with the major airline is terminated. The 2012–13 demise of Lufthansa’s regional partners (Contact Air, Augsburg Airways, Cirrus Airlines) may serve as a warning to such dependency. Some can partially mitigate this risk. As in North America, many of the European regionals diversify their ACMI portfolio by flying for multiple carriers. Others combine ACMI operations with charter flights and scheduled services. 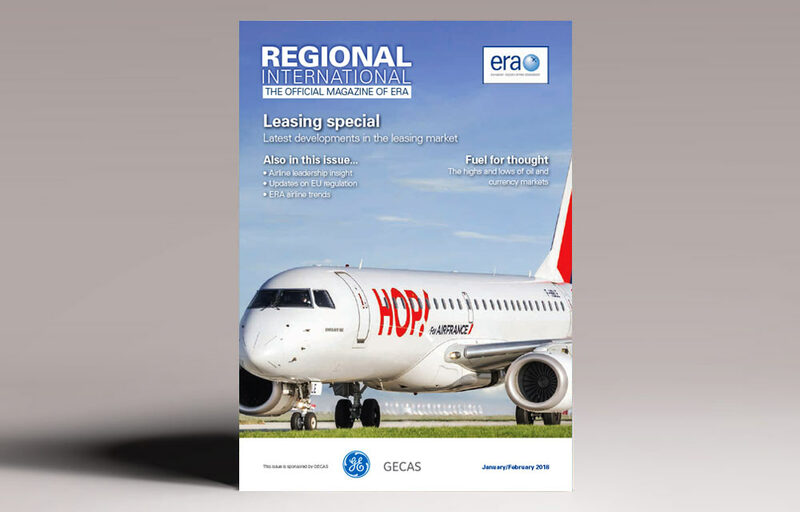 For larger airlines looking to outsource regional operations, there are more options for wet-lease capacity than ever. European regionals are increasingly keen to provide such capacity and TrueNoord believes this to be a broadly positive trend provided that the risk of overdependence on a single major airline customer can be mitigated by flying for multiple carriers in a similar way to many of the US regionals. This article was published in ERA’s Regional International magazine, January – February 2018 issue.